Objectives We investigated access to biologic and synthetic disease modifying drugs (bDMARDs and sDMARDs) in patients with rheumatoid arthritis (RA) across Europe. Methods A cross-sectional study at national level was performed in 49 European countries. A questionnaire was sent to one expert, addressing the number of approved and reimbursed bDMARDs and sDMARDs, prices and co-payments, as well as acceptability of bDMARDs (barriers). Data on socio-economic welfare (gross domestic product per capita (GDP), health expenditure, income) were retrieved from web-based sources. Data on health status of RA patients were retrieved from an observational study. Dimensions of access (availability, affordability and acceptability) were correlated with the country's welfare and RA health status. Results In total, 46 countries (94%) participated. Six countries did not reimburse any of the five sDMARDs surveyed, and in ten countries no bDMARDs were reimbursed. While the price of annual treatment with an average sDMARD was never higher than GPD, the price of one year treatment with a bDMARD exceeded GPD in 26 countries. Perceived barriers for access to bDMARDs were mainly found among financial and administrative restrictions. All dimensions of access were positively correlated with the country's economic welfare (coefficients 0.69 to 0.86 for overall access scores). Conclusions Patients with RA in lower income European countries have less access to bDMARDs and sDMARDs, with particularly striking unaffordability of bDMARDs in some of these countries. When accepting that sDMARDs and bDMARDs are equally needed across countries to treat RA, our data point to inequities in access to pharmacological treatment for RA in Europe. Recent advances in pharmaceutical treatments led to the development of new generation drugs, which are effective but at the same time costly, and thus might present significant economic burden on individuals and societies.1 This is the case of the treatment of rheumatoid arthritis (RA), in which the progress in medical technologies resulted in biological agents that improved substantially the ability to achieve disease remission and decrease the burden of disease.2 The European League Against Rheumatism, and many national guidelines as well, recommend starting synthetic disease modifying antirheumatic drugs (sDMARDs) immediately after diagnosis and initiating biologic DMARDs (bDMARD) after sDMARD failure.3 Despite being very efficacious, the use of these drugs can be lowered by its high cost, as annual prices can mount up to €14 000 (according to report from Kobelt and Kasteng in 2009).4 In 2011, two bDMARDs were in the top 10 of the drug expenditures in The Netherlands and the burden on the drug budget had increased by 20% compared with 2010.1 As a consequence of the high price and budget impact, most countries regulate the access to reimbursed treatment. It is not known to what extent the limited access to these drugs differs among countries and might contribute to health disparities across societies. A recent paper showed that the burden of RA is substantially higher in ‘low Gross Domestic Product (GDP)’ than in ‘high GDP’ countries within and outside Europe.5 The current use of bDMARDs appeared to have a significant inverse association with disease activity in ‘low GDP’, compared with ‘high GDP’ countries. This has raised interest in investigating access to these drugs. Model to explore access to medical care. The objective of this study was to investigate the three dimensions of access (availability, affordability and acceptability) to synthetic and bDMARDs, and to relate them to the level of socio-economic welfare and health status of RA patients in European countries. A questionnaire was developed to collect information on access to synthetic and bDMARDs and was sent between April and October 2011 to one rheumatologist or researcher in rheumatology in each country. All countries of WHO European Region were invited, with the exception of small city-states, Israel, and Kyrgyzstan, where it was impossible to establish a contact. Candidate rheumatologists or researchers were first identified through personal contacts and the membership of the European Musculoskeletal Surveillance and Information Network (EUMUSC.net13), snow-balling technique (via contacts from the contacts) and by searching in PubMed. The questionnaire contained three sections. The first section inquired on availability of the European Medicines Agency (EMA) approved bDMARDs for RA as of April 2011 (infliximab, etanercept, adalimumab, certolizumab pegol, golimumab, abatacept, tocilizumab and rituximab) and the four most commonly used sDMARDs (methotrexate, leflunomide, hydroxychloroquine (or cloroquine where hydroxychloroquine was not available) and sulphasalazine), as well as prednisone. Respondents were asked to indicate the reimbursement status (yes/no) of bDMARDs and, if applicable, the date of national approval and reimbursement. In the section on affordability, prices and respective amounts of individual contributions (ie, out-of-pocket payment) in local currency were inquired. Prices were requested per specified dose for bDMARDs with no cost of hospitalisation and injection included, and per package for sDMARDs (where number of tablets and their strength had to be specified) (see online supplementary table S1). The lowest price of each drug was used for further calculations (ie, for sDMARDs the lowest price per pill depending on the package size and strength of the tablet). Exceptions in pricing, including specific regulations for subgroups of patients, and possibility to negotiate on discounts in specific situations were not taken into account. Moreover, additional budget restrictions at the hospital level were considered out of scope of this project. The third section addressed acceptability, where respondents were asked to give a score on a 0–10 numeric rating scale (10—highest barrier) to the six barriers to access to treatment with bDMARDs. Two questions addressed barriers for prescribers: (1) within the system (ie, administrative and financial) and (2) within the beliefs in bDMARDs compared with classic sDMARDs; and four questions referred to barriers for patients: (3) within the system (access to rheumatologists), (4) resulting from the amount of individual (patient) financial contribution, (5) resulting from lack of trust in these medications and (6) resulting from lack of trust in the healthcare system. Furthermore, an open question on possible facilitators of access was offered at the end of the questionnaire. The returned questionnaires were carefully checked and the collaborators were contacted in case of missing or unclear information. Finally, a preliminary report including the results was sent to all collaborators for review and data check. Commonly used indicators of socio-economic welfare were collected for each of the countries. Data on the number of inhabitants and socio-economic welfare (GDP, total health expenditure, median income and minimum wage) were retrieved from web-based sources.14–16 For each indicator, latest available data for the period 2008–2011 were used. Finally, a simple score was developed to evaluate the level of access to bDMARDs across the countries. For each dimension of access, one proxy variable was selected, that is, the number of reimbursed bDMARDs for availability, average annual price of all bDMARDs (in int. $) for affordability and averaged score on the six barriers for the dimension of acceptability. For each of the dimensions, a score (0–3) was given to a country based either on absolute number of bDMARDs for availability or on the position in the quartile distribution of the variable for affordability and acceptability, and the overall score varied between 0 and 9 (9 meaning best access) (see online supplementary table S4). Analyses were performed for all participating countries (n=46), and then restricted to European Union (EU) member states (n=27). Descriptive statistics are presented. Comparisons between EU and non-EU countries were made using the Mann–Whitney U test (data not normally distributed). Finally, associations between each dimension of access and indicators of socio-economic development and RA health status were explored using Spearman's correlations. Coefficients >0.50 but ≤0.80 were assumed as moderate, and >0.80 as strong.21 SPSS V.19.0 was used. A total of 46 of 49 invited countries (94%, no data from Kyrgyzstan, Azerbaijan and Turkmenistan) returned a completed questionnaire. The characteristics of the included countries in terms of population size, socio-economic indicators, access variables and health status of patients with RA are presented in table 1. In 10 (22%) of the 46 participating countries, none of the eight bDMARDs were reimbursed, two countries reimbursed only one bDMARD (rituximab or etanercept), two to four bDMARDs were reimbursed in seven countries, and 27 countries (59%) had five or more bDMARDs reimbursed (all were EU member states except for Croatia, Iceland, Norway and Switzerland) (table 1) (see online supplementary figures S1 and S2). At least three sDMARDs (always including methotrexate and sulphasalazine) were available in all 46 countries. On average, the total time of reimbursement in each country expressed as % of the total time since EMA approval was 49% (SD 38; median 52). The number of bDMARDs approved and reimbursed in each country, as well as the time they were available for reimbursement, showed moderate to strong positive correlations with indicators of socio-economic welfare, and with a broad range of RA health status indicators (table 2). When limiting the analysis to the 27 EU member states, similar patterns were seen but the associations were weaker. The number of sDMARDs available was not associated with socio-economic indicators or health status. Between countries, prices of synthetic and bDMARDs in national currencies showed a 5- and 2.3-fold variation, respectively, while this difference mounted to a variation up to 7.9- and 4.3-fold, respectively, after adjusting for PPP (table 1 and figure 2). When limiting analyses to EU countries, these differences remained, though on a smaller scale (see online supplementary figures S3, S4 and S5A,B). Within countries, 1 year of treatment with bDMARDs was 60 times more expensive than 1 year of treatment with sDMARDs, varying from 20 (Belarus) to 160 (Ukraine). In absolute terms, an annual treatment with sDMARDs would be 0.01 to 0.23 times the GDP per capita, while for bDMARDs this would range from 0.18 to 11.05 times GDP per capita. Assuming patients should pay the full drug price, the number of days a person with a median income should work to pay 30 days treatment varied from 12 (Luxemburg) to 190 days (Romania) and from 0 to 3 days for biologic and sDMARDs, respectively (median income being available for 30 out of 46 countries). The negative correlation between prices adjusted to PPP and socio-economic welfare was much stronger for biologic than for sDMARDs. Higher drug prices were associated with poorer RA health status (table 2). (A) Ratio between the average price of all available biologic disease modifying antirheumatic drugs (bDMARDs) in each country (int. $) and average price of bDMARDs in all countries (EU countries in black). (B) Ratio between the average price of available synthetic disease modifying antirheumatic drugs (sDMARDs) in each country (int. $) and average price of sDMARDs in all countries (EU countries in black). Int. $, international dollars. The average annual personal contribution ranged from int. $0 (no contribution) to int. $61 552 (full cost covered by the patient) for bDMARDs (mean 9975, SD 16 647) and from int. $0 (no contribution) to int. $1 273 (full price) (mean 221, SD 292) for sDMARDs. For bDMARDs, the annual amount of personal contribution was between 30% and 75% of the annual price of drugs in five countries, and in eight countries its amount exceeded 75%. For sDMARDs, full (co-)payment was required in six countries (13% online supplementary Appendix B, table S2). 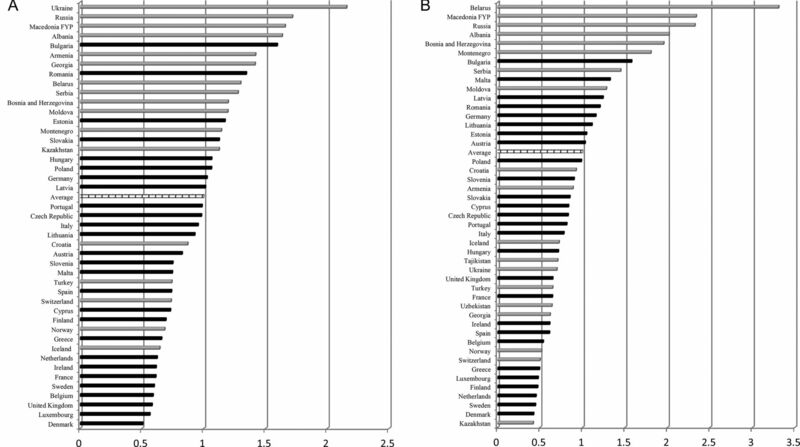 Correlations of personal contributions with socio-economic welfare and health status followed the same patterns as prices, however, with weaker associations for all countries, as well as for EU countries separately (table 2) (see online supplementary table S3). For acceptability, the mean overall score for all 46 countries was 3.15 (SD 2.03), and 2.2 (SD 1.34), for 27 EU countries. In the open question about facilitators of access to bDMARDs in the country, the increasing facilitating role of patients’ organisations was most commonly mentioned. A higher total score on barriers was moderately positively associated with lower GDP and total health expenditure per capita, and was moderately negatively correlated with indicators of RA health status (table 2). When restricting the analysis to the 27 EU member states, no association was found between the score on acceptability and the country's socio-economic status, but moderate correlation with patients’ health persisted. Overall access to bDMARDs ranged from 0 to 9 (9 indicating the best access) and correlated strongly with indicators of socio-economic health and disease activity (table 2, figure 3). 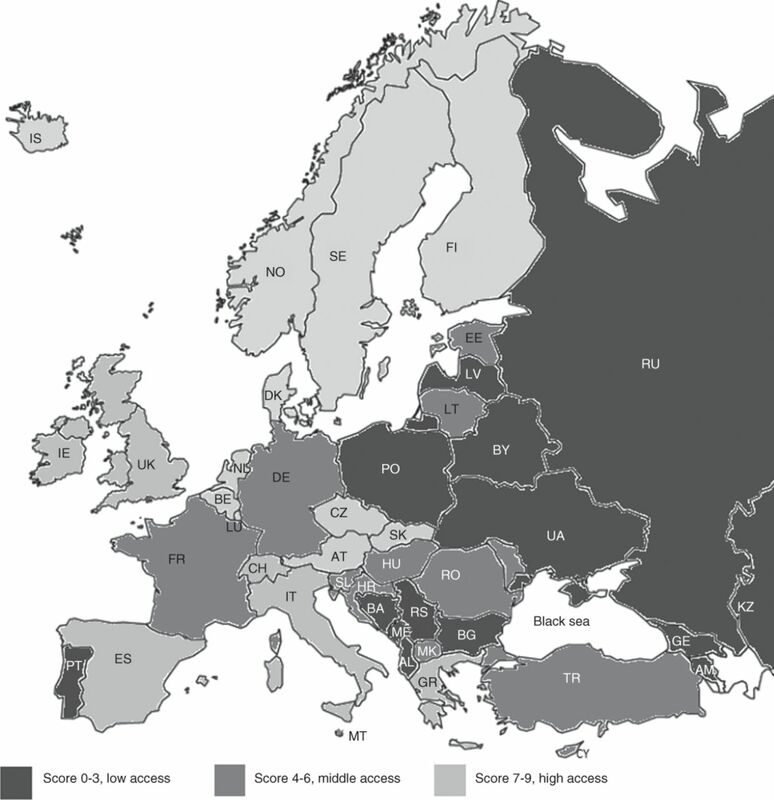 The map (figure 4) shows the countries with relatively high (light grey, score 7–9) middle (grey, score 4–6) and low access (black, score 0–3). In total, 320 million people in the European Region (almost 40%) would have severely restricted access to bDMARDs in case of RA (countries with lowest access). 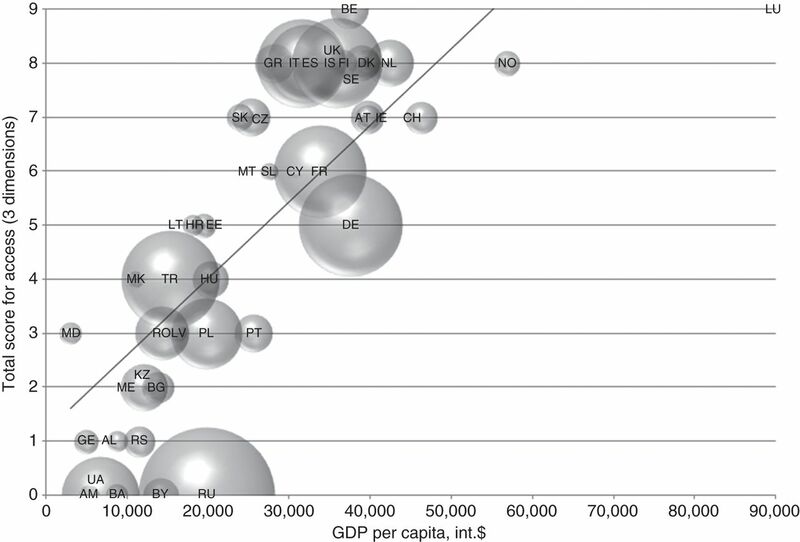 Access to biologic disease modifying antirheumatic drugs and gross domestic product per capita, international dollars (n=44). Size of the bubbles is proportional to the population size of the country. AL, Albania; AM, Armenia; AT, Austria; BA, Bosnia and Herzegovina; BE, Belgium; BG, Bulgaria; BY, Belarus; CH, Switzerland; CY, Cyprus; CZ, Czech Republic; DE, Germany; DK, Denmark; EE, Estonia; ES, Spain; FI, Finland; FR, France; GE, Georgia; GR, Greece; HR, Croatia; HU, Hungary; IE, Ireland; IS, Iceland; IT, Italy; KZ, Kazakhstan; LT, Lithuania; LU, Luxemburg; LV, Latvia; MD, Moldova; ME, Montenegro; MK, Macedonia; MT, Malta; NL, Netherlands; NO, Norway; PL, Poland; PT, Portugal; RO, Romania; RS, Serbia; RU, Russia; SE, Sweden; SK, Slovakia; SL, Slovenia; TR, Turkey; UA, Ukraine; UK, United Kingdom. Access to treatment with biologic disease modifying antirheumatic drugs in the European Region. AL, Albania; AM, Armenia; AT, Austria; BA, Bosnia and Herzegovina; BE, Belgium; BG, Bulgaria; BY, Belarus; CH, Switzerland; CY, Cyprus; CZ, Czech Republic; DE, Germany; DK, Denmark; EE, Estonia; ES, Spain; FI, Finland; FR, France; GB, the UK; GE, Georgia; GR, Greece; HR, Croatia; HU, Hungary; IE, Ireland; IS, Iceland; IT, Italy; KZ, Kazakhstan; LT, Lithuania; LU, Luxemburg; LV, Latvia; MD, Moldova; ME, Montenegro; MK, Macedonia; MT, Malta; NL, Netherlands; NO, Norway; PL, Poland; PT, Portugal; RO, Romania; RS, Serbia; RU, Russia; SE, Sweden; SK, Slovakia; SL, Slovenia; TR, Turkey; UA, Ukraine; UK, United Kingdom. This study uncovered variations in access to treatments for patients with RA across European Region and showed that these were strongly associated with socio-economic development of the countries. Assuming needs for treatment with sDMARDs and bDMARDs are similar across countries, differences in access to medical treatment are unfair and raise alarming issues of inequity. The inequality was especially pronounced for bDMARDs that were not reimbursed in 10 (22% of the 46 countries), and for which 1 year treatment would exceed the GDP per capita in 26 out of 44 (59%) of countries where the biologics were registered in the market. This makes bDMARDs unaffordable in a large part of Europe. A 1-year treatment with a bDMARD could mount up to 11 times the country's GDP. When further exploring (cultural) acceptability, administrative and financial restrictions were identified as the most important barriers to a treatment with bDMARDs. Countries in Eastern and Central Europe were shown to have particularly poor access to bDMARDs. In contrast to the PPP adjusted prices, the amount of individual contributions (in int. $) for biologic and sDMARDs showed less strong associations with economic welfare, indicating that also historic decisions and/or ideology play a role in the choice for private co-financing of healthcare. Findings are consistent with limited literature on the access to treatment among patients with RA. Orlewska et al20 explored access to bDMARDs in 11 countries in Central and Eastern Europe and observed that macro-economic conditions largely explained the differences in access between Western and Eastern European countries. Hoebert et al22 studied the uptake of TNFα inhibitors in four European countries, and among the main findings was a strong positive association between the utilisation rates and total health expenditure. While the strength of the present study can be found in the large number of countries surveyed, the exploration of all dimensions of access and also the efforts to relate access to health outcomes, the study has also limitations. First of all, the questionnaire was completed by only one rheumatologist in each country. However, respondents were encouraged to seek help from local experts and to our knowledge many of them did so. Importantly, the outlier values and unclear data in each case were double checked, thus increasing the reliability of the chosen method. Second, being an ecological study, findings are susceptible to ecological fallacy, making it impossible to capture possible differences in access to therapy between RA patients within each country (eg, variations between health insurance plans among regions or groups of patients).22 ,26 ,27 No data were available on individual socio-economic determinants of health, and the level at which such factors interact with country-level differences in welfare could not be explored. Regional variations, budget limitations (at hospital or practice level), exceptions in co-payment policies based on age, health and socio-economic status as means to regulate access within countries were outside the scope of this research, as they could not be correctly grasped without having data from a patient-level (instead of national-level). Further, data on the clinical burden clinical RA burden were available only for 21 of the 46 the countries.5 Data were based on an average of three (1–7) rheumatology centres per country, limiting the generalisability to all RA patients on a national level. Values present a mix of patients treated with sDMARDs and/or bDMARDS and therefore suitable to explore the relation between differences in access to care and consequences of these differences. Although selection bias is possible, it is reasonable to assume that such bias would be similar in all the countries, thus not compromising our findings. An important limitation is that data on health were collected between 2005 and 2008 while data on access were from 2011; therefore, the associations with health status should be interpreted with great caution. 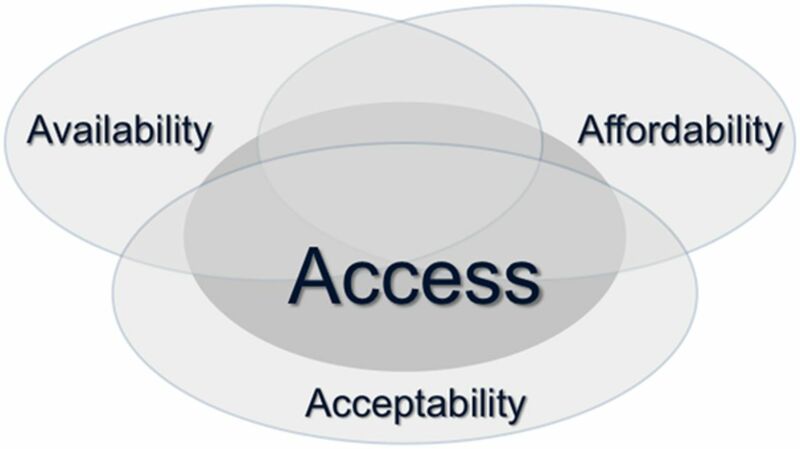 Finally, the measurement of the third axis of access—cultural acceptability—faced serious limitations due to the lack of a validated instrument. The development of a feasible approach to assess this essential aspect of access warrants more research. We would like to acknowledge all the individuals with whom we discussed the ideas presented in this manuscript and who have helped us in any way to complete this project. In particular, we would like to express our gratitude to Ledio Collaku (Albania), Joris De Kock (Belgium), Lyubomir Sapundzhiev (Bulgaria), Ulla Ege Johansen (Denmark), Laszlo Gulacsi (Hungary), Fiona McGrehan (Ireland), Casabella Andrea (Italy), Liliana Groppa (Moldova), Filip Raciborski (Poland), Ruxandra Ionescu (Romania), Maria Kovarova (Slovakia), Elisabet Lindqvist (Sweden) and Oleg Nadashkevich (Ukraine). Tien geneesmiddelen, 20% van de uitgaven Stichting Farmaceutische Kengetallen (Foundation for Pharmaceutical Statistics); [cited 30 May 2012]; http://www.sfk.nl/.
. The burden of rheumatoid arthritis and access to treatment: a medical overview. Eur J Health Econ 2008;8(Suppl 2):S39–47.
. EULAR recommendations for the management of rheumatoid arthritis with synthetic and biological disease-modifying antirheumatic drugs. Ann Rheum Dis. 2010;69:964–75.
. Access to innovative treatments in rheumatoid arthritis in Europe. A report prepared for the European Federation of Phaumeceutical industry associations (EFPIA), 2009. World Health Organization (WHO). Investment for health: a discussion of the role of economic and social determinants. Copenhagen, Denmark: WHO Regional Office for Europe, 2002.
. Access and choice—competition under the roof of solidarity in German health care: an analysis of health policy reforms since 2004. Health Econ Policy Law 2010;5:31–52.
. What does ‘access to health care’ mean? J Health Serv Res Policy 2002;7:186–8.
. Illness costs to households are a key barrier to access diagnostic and treatment services for tuberculosis in Tajikistan. BMC Res Notes 2010;3:340.
. Access as a policy-relevant concept in low- and middle-income countries. Health Econ Policy Law 2009;4:179–93. The European Musculoskeletal Conditions Surveillance and Information Network (eumusc.net). [cited 15 Jan 2012]; http://eumusc.net/. European health for all database (HFA-DB). [cited 26 Oct 2011]; http://data.euro.who.int/hfadb/.
. Access to biologic treatment for rheumatoid arthritis in Central and Eastern European (CEE) countries. Med Sci Monit 2011;17:SR1–13.
. Do rheumatoid arthritis patients have equal access to treatment with new medicines? tumour necrosis factor-alpha inhibitors use in four European countries. Health Policy 2012;104:76–83.
. Cost-effectiveness of biologic response modifiers compared to disease-modifying antirheumatic drugs for rheumatoid arthritis: a systematic review. Arthritis Care Res (Hoboken) 2011;63:65–78.
. Patient access to new cancer drugs in the United States and Australia. Value Health 2011;14:944–52.
. The funding and use of high-cost medicines in Australia: the example of anti-rheumatic biological medicines. Aust New Zealand Health Policy 2007;4:2. Collaborators All members of Working Group ‘Equity in access to treatment of rheumatoid arthritis in Europe,’ namely, Argjent Tafaj (Albania), Ruzanna Harutyunyan (Armenia), Helga Radner (Austria), Nikolay Soroka (Belarus), Herman Mielants (Belgium), Sekib Sokolovic (Bosnia and Herzegovina), Sevdalina Lambova (Bulgaria), Miroslav Mayer (Croatia), Paraskevi Charalambous (Cyprus), Jiri Vencovsky (Czech Republic), Merete Lund Hetland (Denmark), Tõnu Peets (Estonia), Bruno Fautrel (France), Khatuna Letsveridze (Georgia), Ulf Müller-Ladner (Germany), Prodromos Sidiropoulos (Greece), Márta Péntek (Hungary), Gerdur Gröndal (Iceland), Oliver FitzGerald (Ireland), Seriolo Bruno (Italy), Galimzhan Togizbayev (Kazakhstan), Daina Andersone (Latvia), Irena Butrimienė (Lithuania), Marco Hirsch (Luxemburg), Snezana Misevska-Percinkova (Macedonia), Karen Cassar (Malta), Elena Deseatnicova (Moldova), Dusan Mustur (Montenegro), Piotr Głuszko (Poland), Viviana Tavares (Portugal), Florian Berghea (Romania), Ivan Shirinsky (Russia), Miodrag Veljkovic (Serbia), Jozef Rovensky (Slovakia), Matija Tomsic (Slovenia), Francisca Sivera (Spain), Ingemar F. Petersson (Sweden), Finckh Axel (Switzerland), Sharipov Shaydullo (Tajikistan), Nevsun Inanc (Turkey), Tatyana Dumenko (Ukraine), Suzanne Verstappen (United Kingdom), Hojimurad Khudoberdiev (Uzbekistan), have contributed with corresponding country specific data, provided additional insights and necessary clarifications about the national data, and critically reviewed the interpretation of the results as well as final draft of manuscript. Contributors AB conceived the idea for the paper and outlined the study design; PP, SR, TK, TS, TU and AB contributed to data collection; PP, SR, MP and AB were involved in data analysis and interpretation. Figures were developed by PP, SR and AB, and the manuscript was drafted by PP, SR, TK, TU and AB. All authors have critically reviewed the final draft. Funding Polina Putrik was supported by High Potential Scholarship awarded by Maastricht University; Sokka Tuulikki has received grants from Central Finland Health Care District (EVOgrants), the Finnish Academy and Abbott; Sofia Ramiro was supported by the Fundação para a Ciência e Tecnologia (FCT) grant SFRH/BD/68684/2010; Tore K Kvien was supported by Diakonhjemmet Hospital and has received research grants/honoraria from Abbott, BMS, MSD/Schering-Plough, Pfizer/Wyeth, Roche and UCB; Till Uhlig has received honorary/support for travel from Abbott, BMS, MSD, Pfizer and UCB; Annelies Boonen received project grants from Amgem, Abbott and MSD and honoraria from UCB, Abbott and Pfizer.